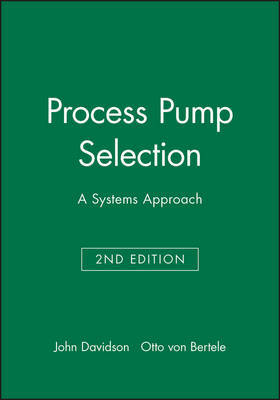 This fully revised and up-dated second edition of "Process Pump Selection" represents the distilled expereince of a team of highly regarded engineers working for large process companies over a period of more than 20 years. It is a classic example of experiential learning, where experience witrh hundreds of pumping installaitons has been synthesized to provide a series of empirical formulae, design guides, and codes of practice for pump users. It is the very essence of professional engineering practice. This text eases the daunting task that faces a process industries' engineer employed in th eprocess industries and responsible for the specificaiton, selection, and purchase of process equipment. There are many national and international specifications laying down design and construcitonal requirements. These deal mainly with the shape and safety issues, but they are no help in selecting a pump suitable for a given duty. Further manufacturers' data give only the basic performance of a pump: the effect of fluid properties and performance limits, as well as control requirements, are not included in catalogue material. This volume provides essential guidelines, based on the operaitonal experience of large numbers of pumping installations over many years on a diverse range of duties and process plants.